If you are keen on Sci-fi stories and real-time strategy games, you may also love Space Settlers developed by Digiarty Software, Inc. in late 2012. This is the first online multi-player Sci-fi themed game for iOS devices including iPhone iPad iPod touch. The graphics are sharp, gameplay is easy, and the whole game is very addictive once you get started. Graphics: It is created with dark blue color that makes you feel like walking in the cold outer space. All the hand-draw bases, buildings, weapons, and various accessories are splendid and of high level. Storyline: It is about human intelligence and advanced technology. Based on Stephen Hawking’s theory and the discovery of God Particles, some explorers went to outer space for Dark Energy Crystal. It brought about space bottlers among different space settlers and legions. Now let’s take a closer look at this online iOS game. It features in mech combat which allows players to load their weapons according to their desires. Currently there are 25+ mech chariot types and 100+ accessories to meet players’ different needs. But remember in mind, to upgrade your weapons, you should gain more Dark Energy Crystals. Besides, it is also real-time strategy game. It asks intelligence to fight with enemy legions/players, to gain more Dark Energy Crystals, and to occupy more planets. So, it is also important to choose legion before joining in. You will also find Space Settlers interesting as you can invite your friends to fight with you together and chat with them online. How to play Space Settlers? Install it on your iPhone, iPad, and on iPod touch. Choose a server and create an account. Now totally 3 servers are available: Doom, Dawn, and Daylight. Start building your base and collect Dark Energy Crystals. The far-famed VoiceOver screen reader used on the Mac has now been made available as a default feature on iPhone 4S, 4 and 3GS. It’s proudly known as the world’s premier gesture-grounded screen reader that will allow you to enjoy the amusive yet user-friendly iPhone even if you see the screen. It is truly commendable that VoiceOver allows you to access using easy gestures to physically interact with the icons on the screen. With VoiceOver you can easily touch the screen and hear the verbal description of the icons pressed followed by a drag or a double tap on the screen. VoiceOver interacts with you as it can naturally discern the location and context of the objects on the screen. This allows you to truly sense how everything appears on the screen rather than just the narration of the descriptions. It lets you know every single detail such as battery status, Wi-Fi, Time of day, Display changes, and even if the screen is locked or unlocked. It allows you to adjust the speaking rate to the best the suits your listening ability and special alert effects for each application that you open or when a message appears and more. All you need to enable the VoiceOver is just the latest version of iTunes and a PC. Its going to be a little different yet simple gestures like instead of tapping to open an icon, you’ll just need to tap the button to hear the description and then double tap the same to open the icon. When you select an item on the screen, a black rectangle cursor appears around the item. This is mainly used when your sharing you phone with someone, else it includes a screen curtain that hides the display of the cursor so no one gets to read without your knowledge. When texting or emailing, you will be able to hear the echoes of each character as you touch the keyboard which also confirms when it’s entered. Also to type more accurately and quickly, if offers word prediction that suggests the accurate spelling of each word. With the option called Speak Auto-text, you can let your iPhone speaking the suggested word automatically using sound effects as you type. This feature can be ignored by continuing with you typing or simply pressing the space key will have the iPhone type the words on your behalf. This VoiceOver works exceedingly well with all the built-in applications that come default with iPhone 4S, 4 and 3GS. The rotor navigation can also be used on web pages that contain common items like images, links and so on. If you are looking for a revolutionary iPhone that enables you to make the applications VoiceOver compatible, then your search ends here. No matter what, this iPhone 4S, 4 or 3GS will certainly be a treat to you. This new feature of VoiceOver will make history! Author Bio: Brianne is a writer blogger. She loves writing, travelling and reading books. She contributes to Rich Gorman Reputation Changer. If you would like to guest post at RealTimeTricks, check our guest posting guidelines. Now if you’re in Mexico and wanted to read any Spanish hoarding just take your iPhone in your hand, open its camera and see that hoarding through your iPhone camera. You’ll see the Spanish hoarding in English, magic, isn’t it? For instance, you’re in Mexican restaurant and wanted to read the menu, there your iPhone camera will help you read the Mexican menu in English. Word Lens is a new iPhone Application which instantly translate printed words from one language to another with your built-in video camera, in real time! The applications looks characters through your iPhone camera and then looks into dictionary to show you back on the screen in translation. Also, the application doesn’t need any network connection for translation it just need camera to look into and to translate. Results appear immediately on your video screen when you need it, anywhere in the world. 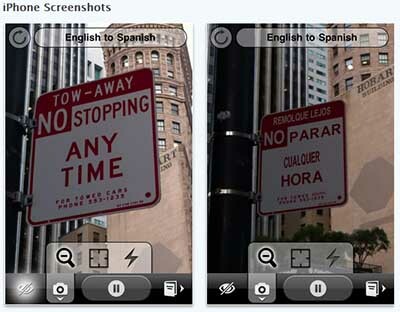 Unfortunately, the current available language pairs are Spanish to English and English to Spanish. In future they have planned to include French, Italian, and even an app for the blind.